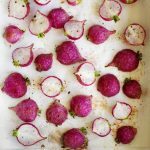 Roasting asparagus brings out their sweetness and tender textures while radishes provide a pepper crunch. Bulgur wheat is a whole grain that is sure to a new household favourite, especially when mixed with roasted asparagus and radish slices and drizzled with a maple olive vinaigrette. 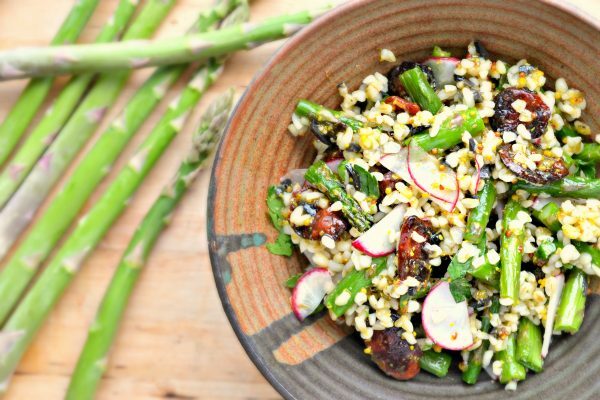 This roasted asparagus and bulgur wheat salad drizzled with maple olive vinaigrette is full of fun textures and savoury flavours that will bring your lunch to a whole new level. Preheat oven to 400ºF/200ºC degrees. 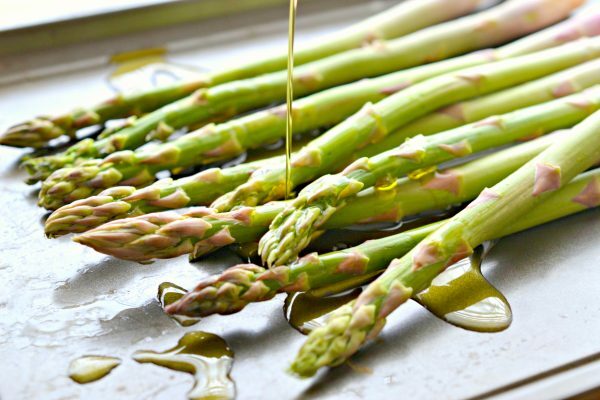 Place asparagus onto a baking sheet, drizzle with 2 tablespoons of canola oil and season lightly with salt and pepper. Let roast in the oven for 15 minutes, then remove and let cool to room temperature. Once cool, chop the asparagus into 1” pieces. Place remaining canola oil in a small pot on medium-high heat. Once very hot, work in batches to fry the sliced chinese sausage until very crispy, approximately 45 seconds-1 minute. Transfer to a paper towel to absorb excess grease. 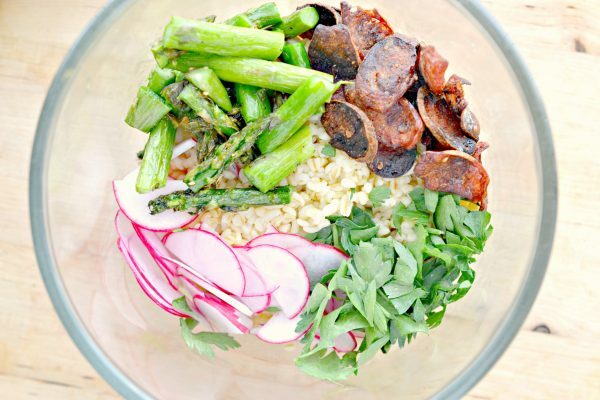 Place bulgur wheat, parsley and sliced radishes into a medium mixing bowl. Add-in the roasted asparagus and fried sausage and toss several times to combine. 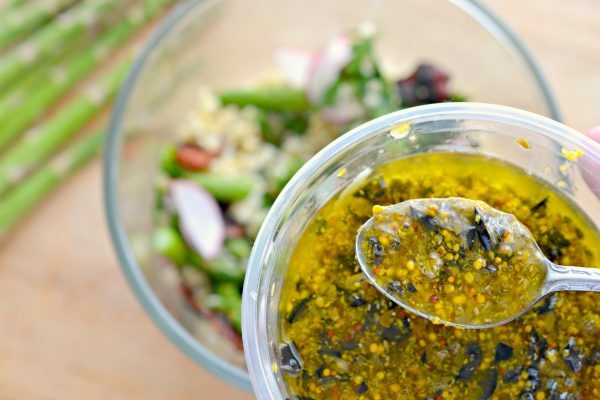 Put all vinaigrette ingredients in a small bowl and stir well with a fork. 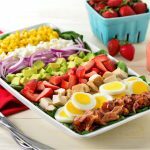 Pour over salad and toss again several times until the salad is evenly coated by the dressing. Transfer to large serving platter and serve. If not serving immediately, combine everything as instructed except the fried sausage, as that will get soggy in the salad if it sits for more than 1 hour or so. 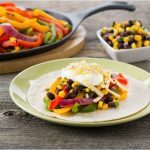 This recipe is developed by Dan Clapson, a food writer and columnist based out of Calgary. His array of published works covers everything from restaurant features and chef profiles to creating recipes and hands-on culinary experiences. 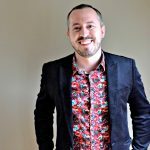 In addition to writing for many recognizable Canadian media sources like Avenue,enRoute, Westjet Magazine and Food Network Canada, he has spent time with many Canadian chefs in professional kitchens to help hone his own culinary skills. He is also the co-founder of an award-winning Canadian food website, EatNorth.ca.